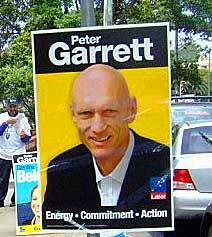 A famous singer in a leading Australian rock band, environmental activist and all-round bien pensant, it was Peter Garrett’s stint as Federal Arts Minister that impelled The Varnished Culture’s perusal of his book. A lot of the time it is a happy memoir – from middle-class childhood in suburban Sydney, with warm milk and bush cricket, trains into the city and boarding school, discovering girls and rock and roll. Garrett’s early account is written with flair and humour. When as a kid he signed up to Australian Record Club, receiving a record in the mail every few months, it “was the only correspondence I ever received”. His upbringing was not particularly political (father was a milk-and-water Liberal, his mother a casual but staunch Labor supporter) yet leftish leanings formed early, largely off an emotional base. His natural sympathies lay with the less fortunate, and his colleagues in what became Midnight Oil shared a similar world-view. But he was a fairly typical young artist, left but not doctrinaire, political but not overtly party political. 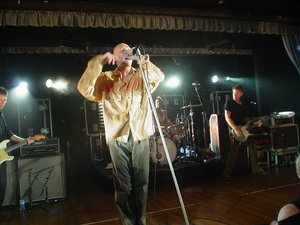 And whilst he was by confession a modest, even lax, scholar, he discovered Integrity (acute, like indigestion), in fronting the Oils, giving his all in performance, helping turn it into one of the most uncompromising and authentic rock outfits riding the new wave. There are good strong chapters on the vagaries of the music industry and when overnight success came, it rode on the back of relentless physical and mental labours, with more grit than glamour. [Incidentally, if you are unfamiliar with their oeuvre, we recommend these songs as an entrée: Don’t Wanna be the One (1981), Power and the Passion (1982), Beds are Burning (1984) and King of the Mountain (1990).] Some of the chapters are a bit pedestrian – the riffs on certain burning issues of the day are too sugary to our taste and somewhat lame – and as an activist it seems he often confused process with outcomes – but Garrett has seen and done interesting things and he has a pretty good memory for details. Which leads to some intriguing asides. When Garrett was 23 years old, the home he and his mother lived in burnt down. He was injured trying to rescue her from the flames – she perished. The trauma and the undeserved feelings of guilt that must attend a tragedy like that are matters we can only guess at – for having opened chapter 6 explaining the difficulty of dealing with the matter, he essentially squibs it over the course of three paragraphs. A forgivable lapse. The other lapse is more intriguing. In a chapter on Garrett’s campaign to blow up the pokies in his local electorate, he claims he was given an envelope full of cash from a person presumably wanting him to lay off poker machine ‘reform.’ When he realised the implications, he handed the package back. Yet his book contains an erratum slip styled as a ‘Clarification’, saying that the envelope actually contained a cheque (which he also returned). The incident is presented as something fairly sinister, and hence memorable, so such an error of detail tends to strain credulity. Entering federal parliament in 2004, he rose rapidly as a celebrity candidate should, and when the Rudd Labor Party took office in 2007, he became Minister for the Environment and the Arts. Some men and women have no background in their ministerial portfolios and yet do well; some step into their ministries as they would their bath, and flounder. Yet he seems to have racked-up some solid work for the environment, dealing with the vested interests, including the green mafia that wrongly assumed he would let no development pass, leading to grumbles that the new Garrett’s every appearance was a sell-out. It also seems fairly clear that the Pink batts debacle was the fault of Kevin Rudd’s over-egged response to the GFC, Garrett’s department foisted with the implementation of a dopey scheme to install roof insulation here, there and everywhere. Firms grabbed the subsidies and sent four youngsters out to die in stifling crawlspaces, hammering metal staples into live wires. Then Rudd panicked; pulled the pin on the scheme, sending a bunch of start-up businesses to the wall, and hanging Garrett out to dry as well. But at least the author confesses his “bones felt heavy” after these little tragedies. He has always had a good, instinctive but also practised, relationship with the media, but when he was interviewed recently by Emma Alberici on Lateline, it gave new life to the Frontline tag “flirt piece” (Chris Kenny in The Australian has written in another context of ABC “interviews of almost tantric adoration”). But in the final analysis, The Varnished Culture liked this memoir. Garrett’s prose is better than his poetry, and his prose is pretty uneven, but we found ourselves understanding the person behind the persona. Unless you are reading Nabokov, that is all you can ask of a memoir.